In the 1990s, researchers in the Arctic noticed that floating summer sea ice had begun receding. This was accompanied by shifts in ocean circulation and unexpected changes in weather patterns throughout the world. The Arctic’s perennially frozen ground, known as permafrost, was warming, and treeless tundra was being taken over by shrubs. What was going on? Brave New Arctic is Mark Serreze’s riveting firsthand account of how scientists from around the globe came together to find answers. In a sweeping tale of discovery spanning three decades, Serreze describes how puzzlement turned to concern and astonishment as researchers came to understand that the Arctic of old was quickly disappearing—with potentially devastating implications for the entire planet. Serreze is a world-renowned Arctic geographer and climatologist who has conducted fieldwork in the Canadian and Alaskan Arctic on ice caps, glaciers, sea ice, and tundra. 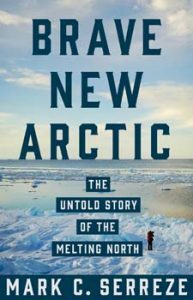 In this must-read book, he blends invaluable insights from his own career with those of other pioneering scientists who, together, ushered in an exciting new age of Arctic exploration. Along the way, he accessibly describes the cutting-edge science that led them to the alarming conclusion that the Arctic is rapidly thawing due to climate change, that humans are to blame, and that the global consequences are immense. 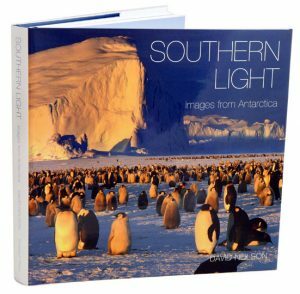 This collection of outstanding landscape and wildlife photographs of Antarctica and the sub-Antarctic is the result of six journeys made to these southern lands by David Neilson. This Australian photographer has been the recipient of two Antarctic Arts Fellowships from the Australian Antarctic Division and has travelled to Antarctica on a yacht on three occasions. 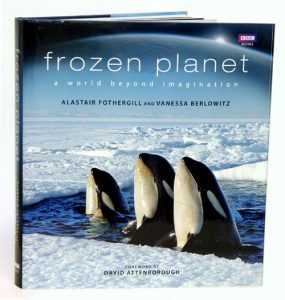 The areas covered in the book include the Antarctic Peninsula, East Antarctica, the Ross Sea, South Georgia and Macquarie Island. There are 130 colour photographs, 100 black and white images reproduced in duotone and seven gatefold panoramas. These images reveal a part of the grandeur and mystery of this great southern realm. Many of the landscape photos were taken with a large format view camera. There is extensive coverage of the wildlife including Emperor, King, Adelie, Gentoo, Chinstrap, Royal and Macaroni penguins, Wandering, Royal and Grey-headed albatross, and crabeater and fur seals. There are also photographs of human activity in Antarctica including images of Robert Scott’s Terra Nova hut on Ross Island. The 20,000-word text includes a narrative of the six photographic journeys and short essays on climate change and protecting the Antarctic environment. Five detailed maps provide a geographic context for the photographs. 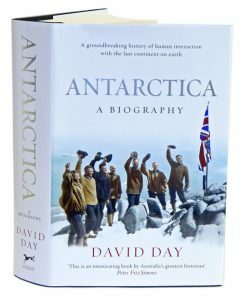 There have been many books about Antarctica in the past, but all have focused on only one aspect of the continent – its science, its wildlife, the heroic age of exploration, personal experiences or the sheer awesome beauty of the landscape- but none have managed to capture the whole story, until now. Gabrielle Walker, author, consultant to New Scientist and regular broadcaster with the BBC has written a book unlike any that has ever been written about the continent. Drawing on libraries and archives from around the world this book provides the first, large-scale history of Antarctica. On one level, it is the story of explorers in the most hostile place on earth as they strive for personal triumph, commercial gain and national glory. 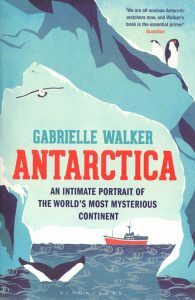 On a deeper level, it is the story of nations seeking to incorporate the Antarctic into their national narratives and to claim its frozen wastes as their own. It was not until 1820 that the continent’s frozen coast was finally discovered and parts of the continent began to be claimed by nations that were intent on having it as their own. On and off for nearly two centuries, the race to claim exclusive possession of Antarctica has gripped the imagination of the world. Science was enlisted to buttress the rival claims as nations developed new ways of asserting territorial claims over land that was too forbidding to occupy. Although the Antarctic Treaty of 1959 was meant to end the rivalry, it has continued regardless, as new nations became involved and environmentalists, scientists and resource companies began to compete for control. A groundbreaking history of human interaction with Antarctica, the last continent on earth. Cold: adventures in the world’s frozen places. Bill Streever unearths the consistent, ongoing influence of cold on the planet. Evoking history, myth, geography and ecology, Streever takes a dip in an Arctic swimming hole, excavates our planet’s ice ages and explores animals’ hibernation habits. Instead of giving the reader a dry, academic lecture, Streever charismatically delivers an anecdotal narrative complete with polar expeditions, Ice Age mysteries, igloos, permafrost and hailstorms. 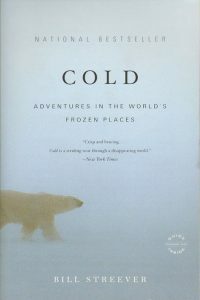 A wonderful insight into the history and importance of cold to both the earth and its occupants. Published to coincide with the centenary of the first expeditions to reach the South Pole, “An Empire of Ice” presents a fascinating new take on Antarctic exploration. Retold with added information, it’s the first book to place the famed voyages of Norwegian explorer Roald Amundsen, his British rivals Robert Scott and Ernest Shackleton, and others in a larger scientific, social, and geopolitical context. Efficient, well prepared, and focused solely on the goal of getting to his destination and back, Amundsen has earned his place in history as the first to reach the South Pole. Scott, meanwhile, has been reduced in the public mind to a dashing incompetent who stands for little more than relentless perseverance in the face of inevitable defeat. “An Empire of Ice” offers a new perspective on the Antarctic expeditions of the early twentieth century by looking at the British efforts for what they actually were: massive scientific enterprises in which reaching the South Pole was but a spectacular sideshow. 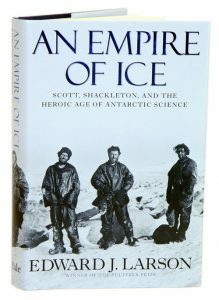 By focusing on the larger purpose, Edward Larson deepens our appreciation of the explorers’ achievements, shares little-known stories, and shows what the Heroic Age of Antarctic discovery was really about. Heart of the great alone: Scott, Shackleton and Antarctic photography. This lavish full-colour publication presents the ill-fated Antarctic explorations of Scott and Shackleton through the eyes of their official photographers. Published to coincide with the 100th anniversary of Scott’s expedition to the South Pole, this book brings together a selection of the astonishing photographs taken by Herbert Ponting travelling on board the Terra Nova with Scott, and by Frank Hurley on Endurance with Shackleton. 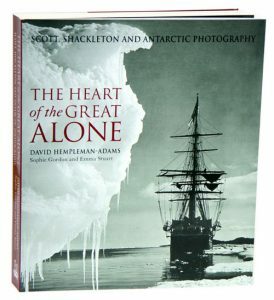 David Hempleman-Adams, one of the world’s most successful polar explorers, introduces Ponting and Hurley’s evocative images, while further essays on the two camera artists and their processes are complemented by maps and chronologies of the expeditions, and biographies of members of their parties. The magnificent photographs themselves are the finest in existence. Some show unique tints applied to them by the photographers. They are presented alongside matchless archival material: the flag entrusted to Scott by Queen Alexandra upon his departure in 1910 and returned to her by Scott’s widow after his death; and a copy of the Aurora Australis, the first book ever to be printed in Antarctica. Artist/Author: Fothergill, Alastair and Vanessa Berlowitz. The exciting successor to the ground-breaking “Planet Earth” and “Blue Planet” series, and has been created by the same award-winning team. Most of us will never travel to these great wildernesses and, even for those lucky enough to have gone, this portrait of our polar regions will surprise and astound. Take a journey to the last truly great wilderness regions. From the great melt in Spring to the 24-hour summer, the beginning of the big freeze and long dark winter, this epic series will follow the dramatic landscapes and the emotional life stories of the animals that live there. Following the stories of the polar bear and wolf in the North Pole and the Adelie penguin and Killer whale in the South Pole, we see how they survive these extremes, how they feed, mate and rear their young. Using the latest hi-tech cameras, the series will reveal animal behaviour as we’ve never seen before – the long, tender mating ritual of the Polar bears, the vast penguin colonies, the Arctic’s most impressive hunter, the wolf as well as Eider ducks, gentle seals and socialable ravens. But the real star of this series is the ice and this book will tell its story, from its formation to its movement and its beauty. And of course what the future holds for it. This is the last chance to explore our frozen planet before it changes forever. Artist/Author: Dermer, Alistair and Danielle Wood. In exquisite pictures and words, A Hostile Beauty tells the story of this extraordinary Australian outpost teeming with life. There are few places today that are truly wild. Macquarie Island is still one such place—a small, wind-blasted rocky outcrop between Tasmania and Antarctica. In exquisite pictures and words, A Hostile Beauty tells the story of this extraordinary Australian outpost teeming with life. 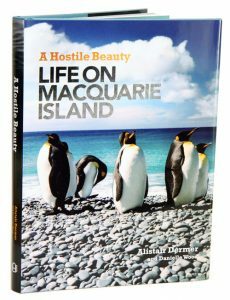 Alistair Dermer’s stunning photography gives us an up-close look at the lives of the inhabitants: gentle gentoo penguins, engorged elephant-seal bulls and scavenging skuas, and takes us deep into a landscape that is as beautiful and life-giving as it is hostile and pitiless. Let these superb images, from the fury of the squalling Southern Ocean to the warm, trusting eyes of a seal pup, transport you to one of the most remote and spectacular places on Earth. Covering more than 7 percent of the earth’s surface, sea ice is crucial to the functioning of the biosphere – and is a key component in our attempts to understand and combat climate change. 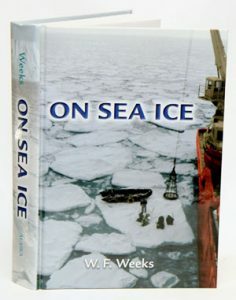 With “On Sea Ice”, geophysicist W. F. Weeks delivers a natural history of sea ice, a fully comprehensive and up-to-date account of our knowledge of its creation, change, and function. The volume begins with the earliest recorded observations of sea ice, from 350 BC, but the majority of its information is drawn from the period after 1950, when detailed study of sea ice became widespread. Weeks delves into both micro-level characteristics – internal structure, component properties, and phase relations – and the macro-level nature of sea ice, such as salinity, growth, and decay. He also explains the mechanics of ice pack drift and the recently observed changes in ice extent and thickness. An unparalleled account of a natural phenomenon that will be of increasing importance as the earth’s temperature rises. Artist/Author: Terauds, Aleks and Fiona Stewart. Many people form a strong connection with wild and remote places. Macquarie Island is such a place. Halfway between Australia and Antarctica, this tiny speck of land in the middle of the Southern Ocean is one of the most remote landmasses on Earth. An Australian World Heritage Area, the island is geologically unique and the plants that live there are found in very few other parts of the world. It is also home to a fantastic and diverse array of wildlife. During the summer months, penguins, seals, albatrosses and other petrels come ashore in vast numbers. For the first 100 years following its accidental discovery in 1810, the humans living there heavily exploited the island and its natural wildlife resources. In 1933, the natural value of the island was recognized and it was declared a wildlife sanctuary. Since 1948, it has also been the site of a permanently populated research station. Today, the island is again a subantarctic wildlife haven. 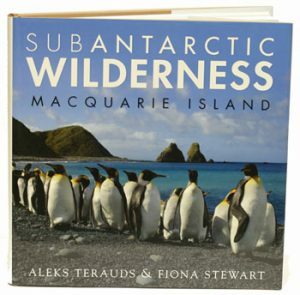 Beautifully illustrated by the photography of Aleks Terauds and the artwork of Fiona Stewart, this book covers all the aspects of Macquarie Island from its rich history to life on the island today, the geology and the plants and, of course, the wildlife that lives there. The crystal desert: summers in Antarctica. The story of life’s tenacity on the coldest of Earth’s continents. It tells of the explorers who discovered Antarctica, of the whalers and sealers who despoiled it, and of the scientists who are deciphering its mysteries. 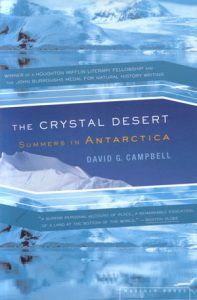 In beautiful, lucid prose, David G. Campbell chronicles the desperately short summers on the Antarctic Peninsula. He presents a fascinating portrait of the evolution of life in Antarctica and also of the evolution of the continent itself.